Learning to drive is a life-changing experience for most. It's not only exciting, but soon you'll be able to enjoy the freedom that comes with passing your test. To help you get there more easily, we have partnered with RED Driving School to give you top tips and advice. Learning to drive is not just about getting a driving licence, it’s an essential skill for life, which is why it’s important to pick the right school. RED Driving School is one of the UK's leading driving schools. They are committed to helping people learn how to drive safely and pass their test successfully. All of their Instructors are of course DVSA registered and in addition they offer free online training via RED's Road Brain Trainer, which is proven to boost your chance of passing the practical test by 14%. As one of the largest driving schools in the UK, they are sure to have an Instructor near you. Your first time behind the wheel can be quite a daunting and exciting experience, so finding the right instructor to guide you through the process is crucial. Asking friends and family for a recommendation is a good place to start. If someone you trust suggests an instructor, ask if they were reliable, professional and how successful the previous student was. Online is the place to look next. Driving schools often have reviews from former customers on their websites, and while some independent instructors may be harder to gauge, it’s a good idea to meet them in advance to discuss your requirements. You may spend a lot of time in the car with them, so it makes sense to find someone you get on well with. All UK instructors have to be licenced by the Driver and Vehicle Standards Agency (DVSA) and undergo a Disclosure and Barring Service (DBS) check to ensure they are suitable to work with young people. You can ask to see these credentials before your first lesson. Exact rates vary depending on the instructor, so make sure you’re clear about exactly how much each lesson costs from the start. You may be taking lessons for several months or longer, so establishing a regular weekly or monthly cost you can afford is a sensible approach. 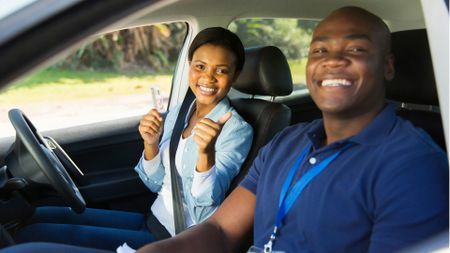 Most driving schools and independent instructors offer introductory discounts, and it can also be cheaper to pre-pay for a block of lessons, so ask about these. The number one complaint about driving instructors relates to money paid in advance, so make sure you get full receipts for all payments, and that you understand the conditions of any discounts or deals – do you lose money if you cancel a lesson, for example? Automatic cars are generally considered simpler to drive because there is no clutch pedal. They’re easier to manage on congested roads or when driving on hills, for example. If you struggle with the gears in a manual car, learning to drive an automatic could be a better solution. Remember that an automatic licence does not permit you to drive a manual car once you have passed your test. That means going for an automatic may limit your choice when buying or renting a car or van in the future. It may also prove difficult to find a local automatic instructor and it’s worth bearing in mind, automatic driving lessons are typically more expensive than manual lessons. Your instructor will often recommend a mock test before the real thing. Make sure you’ve attempted at least one of these – preferably several – and that you can pass them before you even apply for the real thing. The night before your test, make sure you have all the documents you need for your test ready. These include your driving licence, theory test certificate, and confirmation email/letter of the appointment. Have a banana for breakfast. Bananas are well known among instructors as the driving test superfood, as they’re full of B vitamins and contain tryptophan – a type of protein the body converts into serotonin, the ‘happy hormone’ – which will help calm your nerves and keep your mood upbeat. Nerves can reduce your appetite, but it’s important to at least eat something so you have enough energy for the day and can concentrate. Don’t drink energy drinks or too much coffee before a test, as caffeine can heighten your nerves. Sitting in the waiting room before your test is often the time when people feel the most anxious, so it’s a good idea to bring a distraction such as a book or a game on your phone. Breathing exercises are an effective calming technique, so focus as you inhale and exhale. This will have a soothing effect and stop your heart from racing. Laughing is also a great remedy for nerves and helps to boost your mood, so why not watch or read something that really makes you giggle? Remember that this is the worst bit, and most people find their nerves ease once they’re on the road. The examiner is human and they’re not there to fail you – they want you to pass – so don’t be afraid to talk to them as it may put you at ease. There’s nothing wrong with asking the examiner a question or asking them to repeat an instruction if you didn’t hear it, either. Open the window to let in some fresh air if you’re feeling hot and flustered – this can also help to keep you alert. Watch your speed, too. People sometimes speed up when they’re nervous, so just imagine you’re on a normal lesson, breathe, and focus. Learners have to prove they can check basic safety features as part of the driving test, so it pays to swot up beforehand. What is the ‘Show me, Tell me’ part of the driving test? ‘Show me’ and ‘tell me’ questions were introduced to the practical driving test on 1 September 2003. Before you start the driving part of your test, the examiner will ask two questions about basic things drivers need to check to ensure their vehicle is safe. For the ‘show me’ question, the examiner will ask you to demonstrate a basic safety check. For the ‘tell me’ question, you have to explain to the examiner how you would carry out such a check. What sorts of questions will I be asked? The examiner can ask you about things inside and outside the car, but questions will always relate to basic safety checks and ways you can tell whether or not a car is fit to be on the road. They might ask you about things like the horn, lights or brakes, and how to tell if they’re working properly. An examiner might ask, ‘show me how you switch your headlight from dipped to main beam and explain how you would know the main beam is on'. You would then have to turn on the main beams (you might need to switch on the ignition or engine to do so), and point to the main beam warning light. Or, ‘show me how you would clean the windscreen using the windscreen washer and wipers'. You would have to turn on the wash/wipe function, again, possibly with the ignition or engine on. The examiner might ask, ‘tell me how you would know if there was a problem with your anti-lock braking system'. You would explain that a warning light should illuminate if there is a problem with the ABS. Or, ‘tell me how you would check the headlights and tail lights are working'. Tell the examiner you would turn on the light switch and walk around the vehicle to see if the lights were on (though you wouldn’t physically have to do this). How can I prepare for the ‘show me, tell me’ part of the driving test? The government publishes all of the questions examiners are likely to ask in the ‘show me, tell me’ section of the driving test – and the correct answers – on its website, so you can swot up on this part of the test before the day. They also have some videos that show you what this part of the test is really like. Taking your driving test? Then check out the most common reasons for failing, so that you can avoid making the same mistakes. Junctions are hotspots for test failures because there’s a lot to take in and visibility can be difficult. Remember the Mirror, Signal, Position, Speed and Look (MSPSL) system when approaching junctions, and check your mirrors well in advance. Make sure you are looking in the direction the car is travelling before exiting the junction, as this is a very common mistake. If you’re turning right, position the car just left of the centre of the road markings. If you’re turning left keep approximately a metre away from the kerb where there is sufficient room to do so. Reverse parking is a tricky, low-speed manoeuvre where drivers often feel under pressure during the test. The best approach is to keep the speed right down to maintain as much control of the car as possible. Always look well ahead for signs and signals. The sooner you see them, the better, and if you are approaching traffic lights that have been green for a while, expect them to change. Learner drivers are often caught out by changes in speed limits, so when you see a sign indicating a lower speed, make sure you slow down accordingly before you enter the new limit. The same applies to higher limit areas: don’t speed up until you’ve passed the sign. Finally, a stop sign means stop – creeping past one isn’t acceptable. Lanes leading up to a roundabout or major junction often catch drivers out, so look for the signs as early as possible and give yourself plenty of time to enter the correct lane. However, you won’t be penalised if you enter a different lane to the one specified by your examiner during your driving test. Providing you have continued to drive safely, the examiner will not mark you down for deviating from the route, so don’t be tempted to try to correct your direction at the last minute. Checking your blind spot is an easy thing to forget, so it’s a common flaw on a driving test, as well as a dangerous thing to forget. Make sure it’s second nature before you take your test. The same applies to mirrors. Make sure you check your interior mirror and the appropriate door mirror before passing obstacles. If you are crossing the path of oncoming traffic, do not move unless you’re sure there’s time to complete the manoeuvre. A good mantra is, ‘if you can walk across, you can drive across’. Causing another vehicle to swerve or slow down is a guaranteed fail. Though they are not measured on the driving test points system, nerves are arguably the most common cause of failure, as being on the spot causes drivers to behave in ways they often wouldn’t. One of the best ways to beat nerves is to visualise passing the test. There is no reason why you should not pass, as your instructor will not send you for a test until they feel you have reached the required standard. The UK’s weather can turn in a moment, but you’ll be better prepared for the extreme if you follow our tips. Keep double the distance between you and the car in front of you, as it takes double the time to stop on wet roads. When the road has flooded, let the car in front of you go first so you can tackle the water one at a time and keep a slow and steady pace in the middle of the road. Test your brakes are working afterwards. Choose a route that avoids exposed areas, as strong winds can get under the car and significantly affect its handling and braking. Use both hands on the wheel and avoid overtaking high-sided vehicles, as they could be blown into your path as you overtake. Take particular care around cyclists and motorcyclists who are especially vulnerable in high winds. Keep an eye out for twigs or branches in the road. Take particular care early in the morning, as debris that has fallen overnight may not have been cleared yet. Avoid parking near trees or tall buildings. If you break down in strong winds, exit the vehicle by the passenger door and move to a safe location. Lorries and other high-sided vehicles could be blown off course and veer onto the hard shoulder. Ensure you have de-iced the vehicle thoroughly and you can see clearly through all windows before you set off. 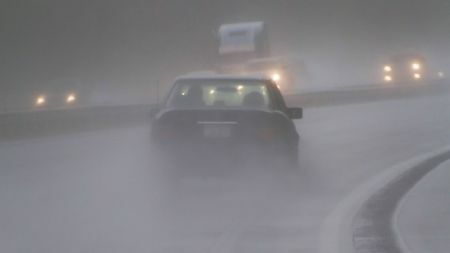 Only drive in ice if your journey is necessary too, as it’s best to stay off the roads when the weather is treacherous. It may be beneficial to drive in a higher gear, as this can help your tyres to grip the ice. Stopping distances can be up to 10 times more than usual in snow and ice, so leave a large gap between the vehicles in front and drive slowly. If traffic in front of you starts to slow, brake gently – slamming them on can cause you to lose control. If your car skids, press the clutch pedal and turn the steering wheel in the direction of the skid. When you start to straighten up, steer along the road. Resist the temptation to brake – it will cause your wheels to lock and you’ll skid further. Slow down to a speed appropriate to the conditions because you must be able to stop in the distance that you can actually see the road. Front lights aid your visibility so use them even in light fog. Save the rear fog lights for dense conditions and consider the vehicle behind, as you could dazzle the driver. Be especially wary of patchy fog – one moment the road can be visible, and in an instant visibility is almost zero. Slow down gradually and give yourself and vehicles behind you time to react to whatever appears in front. If the driver behind is too close, slow down even more to manage the gap in front and if the tailgating persists, find somewhere safe to pull over and let them pass. Don’t be tempted to follow another vehicle at speed just because they seem to be able to see. 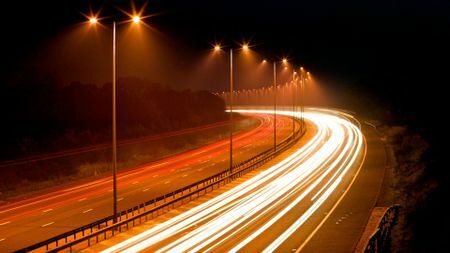 Use your main beams to see as far as possible on unlit roads and ensure your speed is such that you can stop in the distance you can see. Switch to dipped beams immediately if you see another vehicle approaching. 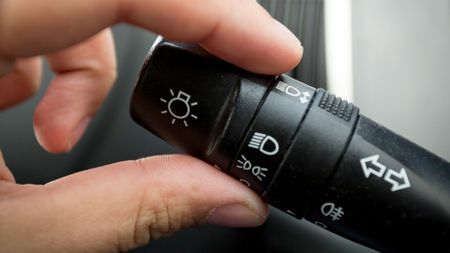 Some modern vehicles have bright HID headlights that despite being legal and dipped, can make it hard to see. Don’t be tempted to flash your lights – that will only dazzle the other driver. Focus on the left hand edge of the road and try not to look at the approaching headlights. If in doubt, slow down. In towns and cities, keep watch for pedestrians wearing dark clothing and cyclists without lights. Passing your driving test is just the beginning. The Pass Plus course readies new motorists for night time, rural and motorway driving. The pass plus qualification is for drivers who have recently passed their driving test and want to improve their skills and drive more safely. Drivers with a provisional licence who have not yet passed their test cannot drive on motorways, so they are limited in the exposure they receive to all types of driving. New drivers can face extremely high insurance premiums, as their lack of experience means they are considered the highest risk group. The Pass Plus scheme is designed to help drivers gain confidence and experience after passing their test, including learning how to reduce the risk of accidents. Many insurance companies offer discounts to drivers who have completed a Pass Plus course, so you could qualify for cheaper premiums, while some local authorities offer discounts of up to 50% for Pass Plus training to residents living in their areas. Can't find what you need here? The government has a large selection of practical advice on the Gov.uk website, including all the legal knowledge you need to get on the road. You've probably started to consider what your first car might be. If you haven't, then it’s a good idea to start researching your options and understand what's right for you. We’ve got useful advice on buying and owning your first car and if you're not sure what you're looking for, then we have search tools to help you find the right one for you. If you're one step ahead and already have your car, see our advice for maintaining it and keeping running costs down. Also check out our reminder service so you never miss and important renewal date.